potentially nervous: clover bunny smiles. "Smile while you munch" ;from the Bunnny Code of Ethics and Good Table Manners. Very excellent smile. A green grin. Hmmmmmmmmmmm. No would guess that they are savage thugs,lying in wait, ever protective of their turf,attack bunnies ready to pounce on the unwary. Those are very happy bunnies! 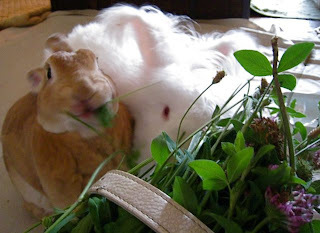 Clover and Bunnies -- makes us smile too! boy did i need some happy today and this did it!